February is usually the most hectic month for me – more hectic than even the holiday season! Between my husband’s birthday, my birthday, AND our wedding anniversary, there’s plenty of celebration to be planned (and enjoyed), but it’s also the time of the year when perhaps the gusto with which I attack each January starts to catch up with me. Like, tell me again why I planned to start training for a half marathon while juggling a half dozen private clients, a brand new nutrition group, five public yoga classes a week, two non-profit jobs, and the mounting of a cabaret? In the dead of winter?! No complaining here though. I feel invigorated, if a little frazzled, and I’m taking it one day at a time, one breath at a time, one break from the computer at a time — and always keeping an eye out for my MBP Daily Three. 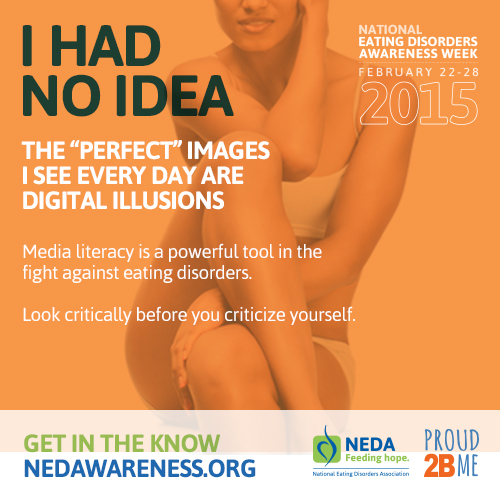 One of my favorite offerings from NEDA so far this week is this Media Literacy Toolkit, which includes, among other awesome info, a quiz to help you determine your digital body image and examples of how to send your feedback to advertisers. What do you think — would you take the pledge? I promise to move beyond society’s ideal body standards and embrace my own body. I promise to tell myself one positive thing about my body every time I look in the mirror and appreciate that I am original and there’s only one me. I pledge to respect my body and not try to fit media’s image of attractiveness. I promise to keep a healthy and active lifestyle for myself and no one else. I pledge not to judge people based on their body shape and size, especially if they do not fit the cultural body ideal. I pledge to be proactive about negative body images and challenge unrealistic and demeaning body talk. I pledge to advocate for positive body image messages—that includes not to buy from companies or support organizations that use unrealistic and unattainable body ideals to sell a product or promote a cause. I pledge not to retouch my photos in order to enhance my appearance online. I pledge to become more media literate and think critically about what I see, hear and read, especially on social media. Finally, I pledge to love my body unconditionally. If I’m totally honest with myself, holding to this pledge in its entirety would be a serious challenge. This is not easy stuff here, folks; we’re talking about reversing years of negative conditioning. But what a goal to work towards! Which of the above pledges will you work towards this Eating Disorder Awareness Week? Let me know in the comments below.